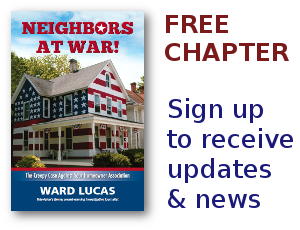 American flag Archives - Neighbors at War! The Flag, Just A Holiday Decoration! No Comments on The Flag, Just A Holiday Decoration! Writing this blog is beginning to give me hives. I guess I’m just allergic to stupid people. The self-proclaimed dictator of the Chestnut Place Homeowners Association in Murray, Utah, says she’s tired of looking at American flags and she’s beginning to fine homeowners who display them. You think I’m making this stuff up? Come on, guys! You know I’m not. 2 Comments on No Frickin’ Flags Here! What is it that Homeowners Associations hate so much about the American flag? Well, I take that back, fascism and American patriotism are pretty much at odds. Angie Hildebrandt, a condo owner, is being assessed daily fines because she flies her flag outside her home at the Southdale Gardens Condominium Association in Edina, Minnesota. Her two sons are in the military and every generation in her family has fought in wars on behalf of America. Her first flag was stolen. Overnight someone paid a visit to her home and ripped her flag to shreds. Flag etiquette is a touchy subject in this country. The U.S. Supreme Court has ruled that burning the American Flag is a protected form of speech under the First Amendment. Still, we hear calls from elected politicians that displaying the Confederate Flag is not protected speech. The beginning of the Confederate War was never about slavery, it was about the massive tax burden being imposed by the North against southern businessmen. The slavery issue arose two years into the Civil War and at that point the Stars and Bars and slavery were forever linked. An HOA apologize to someone it’s wronged? When pigs fly! When the Post Falls American Legion announced it would support the vet’s right to display the flag from inside his home, the HOA board quickly crawled back down its hole, saying it would rescind the violation and even apologize to the veteran. Yes, some pigs can fly. Not often. But it’s a beautiful sight to see. A neighborhood in Pendleton, Oregon is furious with a homeowner who’s begun flying his flag upside down as a protest against President Barack Obama. 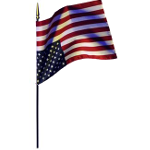 The upside down flag is recognized internationally as a symbol of distress. Oregon has long been one of the most left-leaning states in the country and it’s full of Homeowners Associations. The surprising thing is that an Oregon neighborhood is protesting any display of the American flag at all, right side up or upside down. While this blogger takes no public position, left or right, on politics, he still believes that American citizens have a Constitutional right to Freedom of Speech. And historically that means freedom of expression, even if the way a belief is expressed nauseates others.